Steve Skinner, of Able Towing, prepares to remove an overturned SUV from a culvert along southbound I-75 near exit 120 in Shawnee Township on Friday. The Lima Post of the Ohio State Highway Patrol reported the SUV was southbound on I-75 at 10:02 a.m. Friday when the driver lost control. The name of the driver wasn’t released Friday. The dispatcher said no one was transported to the hospital, but the driver may have been treated at the scene. Details were unavailable Friday. 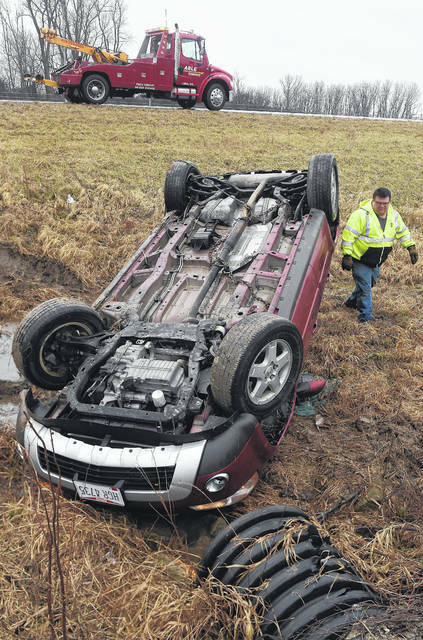 The Lima Post of the Ohio State Highway Patrol reported the SUV was southbound on I-75 at 10:02 a.m. Friday, near the 120 exit, when the driver lost control and ended up on its top in a ditch. The name of the driver wasn’t released Friday. The dispatcher said no one was transported to the hospital, but the driver may have been treated at the scene. Details were unavailable Friday.